Welcome to KERN's translation office in Saarbrücken! Saarbrücken is not only the state capital of Saarland, but also a university city and the only large city in Saarland. It is therefore the political, economical and cultural centre of the region. At the same time, when viewed historically, Saarbrücken is still in its infancy. The city was first created in 1909 by the merger of three towns which had been independent up until that point. KERN has been located here and assisting clients with various multilingual services since 1993. Our branch is located in close proximity to the River Saar and is easily accessible from the main railway station in just a few minutes on foot. Come and get to know us in person. We look forward to your visit! Take the S-Bahn (suburban train) to Kaiserstraße station. Cross Kaiserstraße and walk along Sulzbachstraße, which leads to the pedestrian zone in Bahnhofstraße. The KERN branch is located to the right across the T-junction at number 75 Bahnhofstraße on the 4th floor. Or take the bus to the Bahnhofstraße stop. 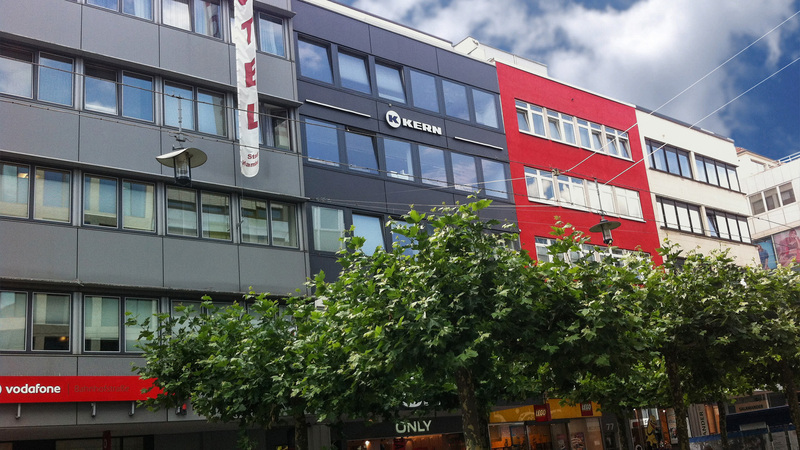 The KERN branch is approximately 100 metres away on the right-hand side of Bahnhofstraße in the direction of St. Johanner Markt. From the west or east – On the A620, take the exit marked "Wilhelm-Heinrich-Brücke". Continue along Stengelstraße. Turn left into Stephanstraße, which then becomes Kaiserstraße. Afterwards, take the second left into Sulzbachstraße and park in the Lampertshof car park, which is the closest one to the KERN office. Sulzbachstraße leads to the pedestrian zone that you can see from the car park. The KERN branch is located to the right across the T-junction at number 75 Bahnhofstraße on the 4th floor. From the north – On the A623, keep left, join the B41 (B41/Rodenhof) and continue for about 3.5 km (just over 2 miles) onto Dudweiler Landstraße then Dudweilerstraße. Then turn right into Kaiserstraße. Afterwards, take the second left into Sulzbachstraße and park in the Lampertshof car park, which is the closest one to the KERN office. Sulzbachstraße leads to the pedestrian zone that you can see from the car park. The KERN branch is located to the right across the T-junction at number 75 Bahnhofstraße on the 4th floor. From the south – On the A1, continue onto the B268 (Lebacher Landstraße), which then becomes Rastpfuhl and Lebacher Landstraße. Turn left onto the B51/St. Johanner Straße. Keep right on Trierer Straße. Then turn right into Faktoreistraße. At the roundabout, take the third exit for Hafenstraße. Then turn left into Viktoriastraße, which becomes Ursulinenstraße. Turn right onto Richard-Wagner-Straße and right again onto Dudweilerstraße at the traffic lights. Then turn right onto Kaiserstraße. Afterwards, take the second left into Sulzbachstraße and park in the Lampertshof car park, which is the closest one to the KERN office. Sulzbachstraße leads to the pedestrian zone that you can see from the car park. The KERN branch is located to the right across the T-junction at number 75 Bahnhofstraße on the 4th floor.